AFs Kiin on Fan Attention: "I don't feel a sense of competition from Khan. If I perform well, I'll get it"
Afreeca Freecs secured their 7th win. On the 27th of February, the 26th day of the 2018 LCK Spring Split took place. On the 1st series, AFs played against KSV. 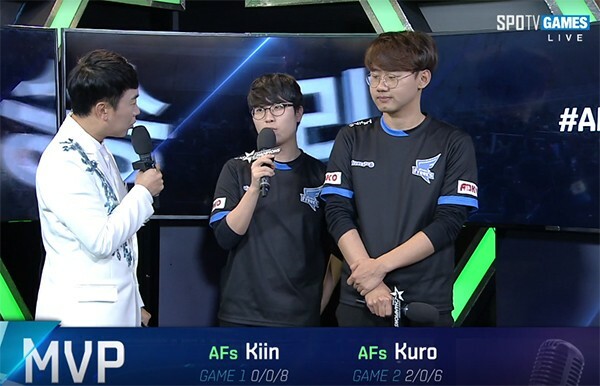 By playing around Kiin and Kuro, AFs defeated KSV with a score of 2-0. One thing to note today was that Aiming, the new ADC of AFs, played in place of Kramer, and he proved himself strong by fully pushing Ruler to his limits. In game 1, the flow of the game was in favor of KSV. Ambition's gank had Aiming killed and Spirit as well in a later fight in the botlane. However, AFs' toplaner and midlaner took full advantage of their champions' mobility and evened out the kill-score. Afterward, by continuously winning fight after fight, AFs successfully takes down all of KSV's outer towers. KSV did their best to avoid AFs' aggressive attacks... but in the mid-to-late game, the initiation from Kiin's Sion and the damage from Kuro's Taliyah proved too much. In the end, AFs secured the first win. Game 2 was quite one-sided. In the early-game, Aiming's Kalista rained spears down on CoreJJ who was protecting the lane alone and took the early lead. Afterward, AFs started taking objectives throughout the map and gave no room for KSV. Kuro also played Malzahar, a champion that was rated lowly in patch 8.3, to its full extent - using his ultimate to initiate every important teamfight. After the series, the two players who won the MVP titles for today's series, Kiin and Kuro, were invited for an interview with the casters - along with a special guest. Today's MVP title was Kiin's very first! How do you feel? Kuro didn't receive that many MVP titles this season, but nonetheless, you've performed well in many games. How do you feel receiving the MVP title today? Kuro: It's been a while since I've received one. I'm happy that I have. Also, it's kind of disappointing that I didn't receive an MVP for my performance on Leblanc a while ago. In game 1, your team didn't provide support to the toplaner in any way. Was it a certain team strategy? Kiin: No one dies in a Sion vs. Ornn matchup... The enemy jungler was focusing our botlane, so naturally, so did Spirit. Kiin, you're a relatively new toplane talent that has been performing well. However, Khan has been garnering all the attention. Do you feel a certain sense of competition from that? Kiin: No, I don't feel anything like that. If I perform well, I'll get that attention. I just do what I need to do. Any memorable moments in game 1? While inside a midlane bush, you lifted multiple people airborne with Sion. Who made the call for that play? After killing CuVee, did you become certain that you guys would win the fight? Kiin: All of us were pretty certain. A lot of players said that playing against Zoe with Malzahar is one of the hardest matchups to date. What is your opinion? Kuro: Whether it be Malzahar or Zoe, whoever plays better wins. It's case by case. Your team was in high spirit in Round 1... but that seemed to have died down as you guys started a losing streak. What kind of feedback went back and forth between the players and coaches? Kiin: After the Lunar New Year holiday, we lost a lot of games. We blamed our lack of practice during the break, so we simply increased the number of practice hours. Kuro: I judged that the teamwork within the team was not like before. Currently, we're practicing almost excessively, but we're getting back to where we originally were, so it's okay. You guys caught Zoe out near the enemy blue buff. Was a call made for that kill beforehand? Kuro: We were initially planning to kill Skarner, but Zoe came instead. You guys completely took over the game after winning a fight near the enemy mid-inhibitor. Kuro: After the Ryze death, things could've gone badly for us. But then, our team judged that we would win the 4 vs 5 fight. Ruler's Tristana was out of position, so we killed him immediately. (A question from the fans) You'll have to play the following teams in this order: KZ - KSV - SKT. What do you think about that? Kiin: We'll have to play top teams consecutively from very early on. We'll have to do our best. But later on into the split, we'll be at ease. Kuro: Round 1 was basically the same as right now. We faced against KZ, KSV, and KT - very strong teams. If you win against strong teams from very early on, it'll be the best start that you can get. In Round 2, we'll do our best to beat them. If we continue to perform like this, I think we'll be able to. Today, the rookie player, Aiming, played in place of Kramer. Was he nervous at all? Kuro: He told us that he wasn't nervous before the match, but he kept on stating that he is during the game. So I gave him a little neck massage to help him relieve some tension. How did Kuro help you before the match? In game 1, you died very early on. Things could've gone badly for you and your team. Aiming: I'm sure that there are people that like me, and those who don't. I'll make the haters like me. Kiin, I heard that you're graduating this year. However, you weren't able to attend the graduation due to the LCK. Were you disappointed at all? Kiin: I couldn't even receive my yearbook yet... I was sad that I couldn't go. Lastly, can you give a word to your fans? Kiin: We still have a long way to go. We'll do our best to reach 1st place. Kuro: We'll win against every team from now on and make Worlds! AFs Aiming on Goals: "I want my solo queue teammates to assume that they'd win if they see me"